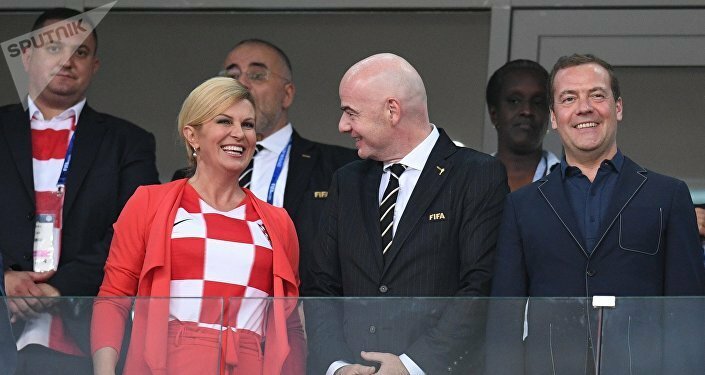 MOSCOW (Sputnik) - Vladimir Putin gifted Croatian President Kolinda Grabar-Kitarovic a bouquet of flowers, and in return, she presented the Russian President with her national team football shirt with Putin's name printed on the back, a Sputnik correspondent reported. Croatian President Kolinda Grabar-Kitarovic thanked her Russian counterpart Vladimir Putin for preventing any hateful statements during the 2018 FIFA World Cup and gifted the Russian president Croatia's football shirt with 'Putin' and the number 9 printed on the back. "This World Cup is a real example for the rest of the world of how such tournaments should be organized. For not only did you provided free transportation for fans but also prevented any cases, any statements of hatred. It's a real example for the whole world," Grabar-Kitarovic said during the meeting with the Russian President in the Kremlin. 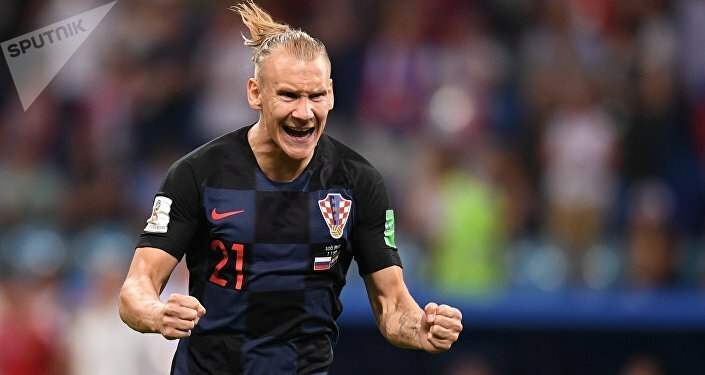 After Croatia beat Russia 4-3 on penalties in the World Cup quarter-finals on July 7, a video appeared on social media showing Croatia defender Domagoj Vida chanting "Glory to Ukraine!" and coaching assistant Ognjen Vukojevic saying "This is a victory for Dynamo [Kiev] and Ukraine." Both Vida and Vukojevic played for Ukrainian Premier League club Dynamo Kiev. Vukojevic was suspended from his duties at the World Cup by the Croatian Football Federation and fined $15,000 for unsporting behavior by the FIFA Disciplinary Committee, while Vida was handed a warning, avoiding a ban that would rule him out of the rest of the World Cup. On Monday, a fresh video showing Vida saying "Glory to Ukraine!" was posted online. Croatia, who claimed the third place at the 1998 FIFA World Cup, will take the winners of that tournament, France, in the final, which will be played at Moscow's Luzhniki Stadium later on Sunday at 18:00 local time (15:00 GMT).